What the Hey? – WALK THE EDGE WITH US…. This is not happening. It isn’t supposed to happen. We moved here so it would never happen to us again. Not possible. And yet, here it is. What you see here is apparently a provincial crisis, causing the shut-down of schools, construction, driving to Victoria and other seemingly over-cautious things which we are seeing around town. Two people show up for yoga. Downtown Sooke is quiet. The roads are nearly traffic-free. Walking is considered dangerous. Signs all over the place communicate the dire straits in which British Columbians find themselves. Sorry, couldn’t find the ice to show in the picture. I’m sure it’s around somewhere. However, after one day of falling snow, sleet and below zero temperatures, it’s gone. It’s now rain, a bit of cold sun, and more rain. Hey, it’s six above zero and a little wet. Great. But, no matter what the weather, we’ve got a lot happening. Another fabulous hike has been completed with four or five kilometers (each way) of rugged, amazingly beautiful terrain filled with up and down steps, climbing over roots, slogging through puddles and just generally communing with nature. Mystic Beach ends in a breathtaking view, miles and miles of rock- covered sand and..what’s that… a waterfall? Too much beauty to describe – have a look. All this is awesome but of course it comes with at least one acropheliac challenge. But, not looking down AT ALL and going fast does the trick. Winnipeg and early Christmas next week. We’ll stay with Jim’s mom, a warm and pleasant thing to do and from there rotate to family, friends, parties and dinners. There’ll be an early celebration and gift exchange with a son and his partner (dying to visit with them) and everybody else we manage to cram into our short time here. Yahoo! 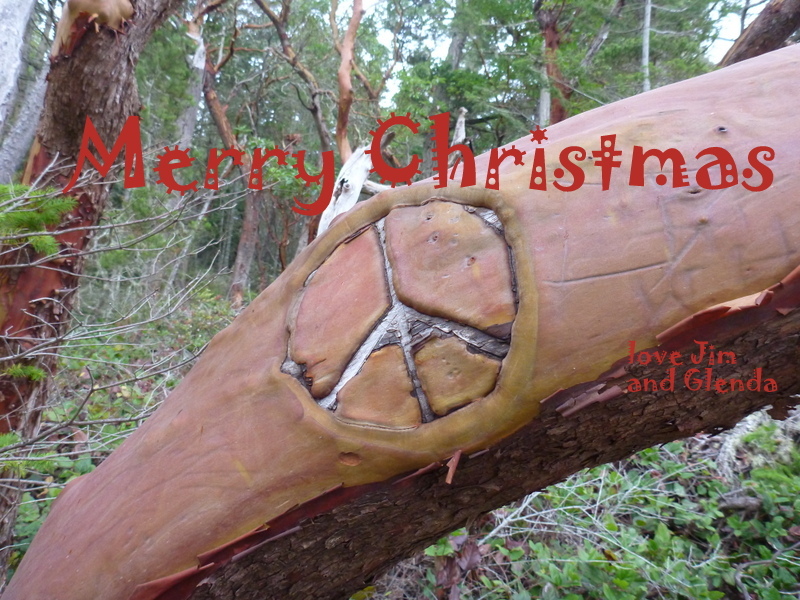 Christmas in Comox on the 24th and 25th with gifts we are very excited to have bought. We worked hard to get exactly the right presents for two teenagers, their six -year old sister and their mother. When we hit upon the right thing, we were ecstatic. Oh boy, is this going to be fun. Just so long as they don’t want me to swing through the tree tops with them. Edmonton on Boxing Day with kids and gifts and turkey dinner ready when we arrive. The kid rush here is huge (three active boys; four if you count their dad) and the noise and fun level at the max. We usually can’t wait to get there and can’t believe the quiet after we leave. Having said that, the let-down is painful every time. And then Calgary Christmas (a bit late) and New Year’s Eve, where we are going to babysit a three-year old, and additionally, have the privilege of being present for the arrival of a new grandchild. During this time we will simultaneously become thoroughly exhausted AND grandparents of the year (in our opinion).Wow! And so, our suitcase is packed for a month of travelling, our excitement is growing and our credit card is maxed. Life in Sooke , snowing or raining, will be on hold while we indulge in warm fuzzies, hugs and too much food. Who could ask for more? And to you all…..
Can’t wait to see you G!